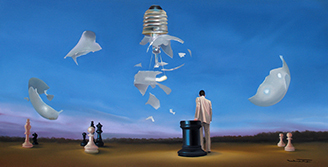 Brainstorming II is a unique surrealist conceptual fine art poster featuring a shattered lightbulb above a landscape scattered with chess pieces. This wall art shows a creative perspective on the concept of the lightbulb representing ideas, and chess representing strategy. This piece will add interest and class to an office environment. Hold On by Rene Schute reflects the turmoil of impending doom, knowing that if you lose yourself for a moment it will cause your downfall. This suspenseful fine art poster will make a warm addition to any private collection. 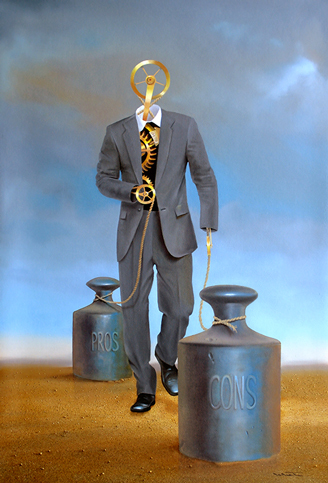 Pros and Cons by Rene Schute is a steampunk interpretation of how people are tied to their decisions. This conceptual fine art poster will add a bright center of interest in any interior design. Self Control by Rene Schute is a conceptual piece of wall art that illustrates the feeling of losing control. This wall art will add a flare of interest to any office environment. Take Your Chance by Rene Schute captures a feeling of solitude and hope in shades of blue and beige. This fine wall art will add interest to a home or office. 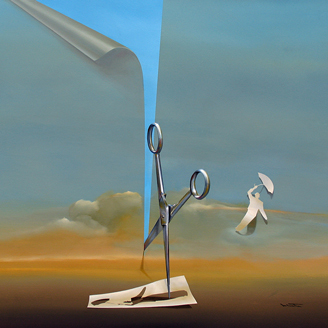 The Cut by Rene Schute is a surreal painting that shows a desolate landscape being cut away to reveal a bright summer sky. This conceptual wall art will add interest and intrigue to your home or office. 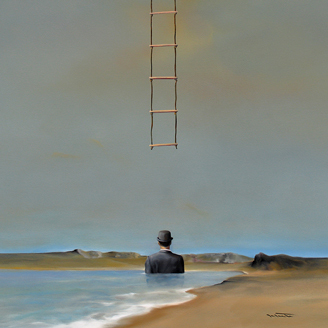 The Pessimist by Rene Schute captures the surreal neature of pessimism and how it can hang over a life like a dark cloud. This conceptual painting will bring an appreciation of life to your home or office. 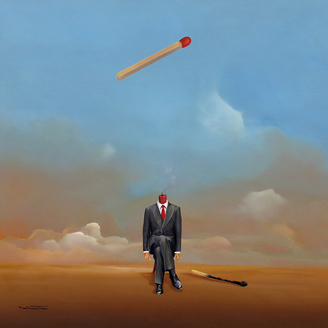 The Second Chance by Rene Schute is a conceptual fine art poster featuring a man with a match head sitting in solitude. 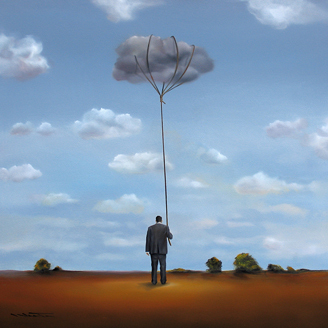 The surreal nature of this fine art piece will add intrigue to any setting. 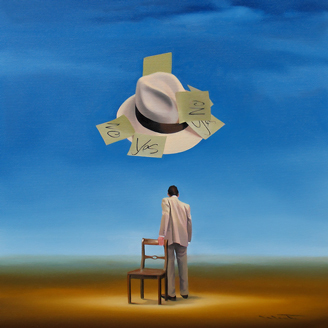 The Thinking Cap by Rene Schute is a thoughtful fine art poster that portrays the common phrase in practice against a flat landscape and blue sky. 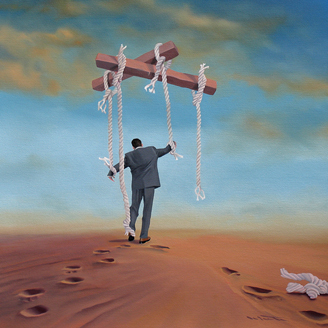 Waiting for the Right One by Rene Schute is a conceptual painting comparing and contrasting phrases about there being someone out there for everyone. 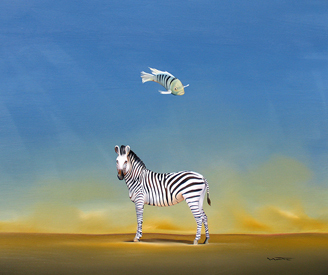 This romantic idea is portrayed through a fish suspended above a zebra on a desolate landscape. This fine art poster will add interest and clean design to any environment. 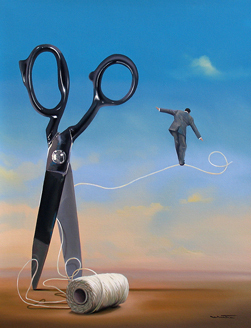 Walk the Line by Rene Schute captures a surreal portrayal of keeping control when life seems off balance. This suspenseful fine art poster will add interest and intrigue to any interior design. 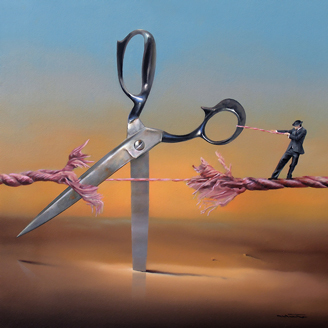 Work-Life Balance by Rene Schute is a surreal conceptual painting that explores the stresses and fears of balancing work and play. This relatable piece will add an element of intrigue to an office setting. Rene was born in Germany in 1969 and raised within a traditional middle class background. Despite all the efforts of his family to follow down the easy and comfortable and middle class life style he early discovered his love and passion for the unconventional. The lack of understanding and nonacceptance of his surroundings triggered the exploration of different forms of expression with a strong focus on painting and specifically surrealism. 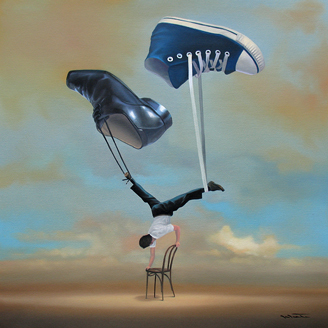 Rene’s professional development, who was originally trained in the commercial and trading sector, was more and more driven by his passion for art revealing in 1995 his work at an exhibition for the first time to the public. Since 1996 he works full time as an artist and 2002 his international career was leveraged with his first exhibition in the USA. Rene’s paintings are featured by very high technical standards, generally marked by a pragmatic and clear language and dominated by the main message cutting out any rich and filling elements. Today’s spirit of the time, his own feelings and the whole spectrum of human emotions are mirrored by his paintings and should be understood as an inspiration to take different perspectives on life. Rene has had always a dislike for norm, convention and labelling. However if asked he would classify himself as a representative of the ‘modern surrealism’.